Transforms your Convert Harness into a Dog Backpack. This Convert Saddle Bag set compliments the EzyDog Convert Harness by turning it into a dog backpack. The bags attach to each side of the harness by simply feeding the webbing loop through the plastic ringlet on the Convert Harness then sealing down the velcro to stop the bags from bouncing around. 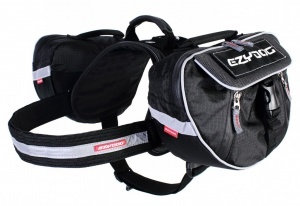 The Saddle Bags feature a large main compartment and a quick access front section for the items you need more regularly. 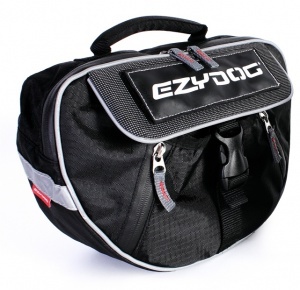 All zip closures are waterproof and the bags are finished with reflective trim for safety on night-time walks.